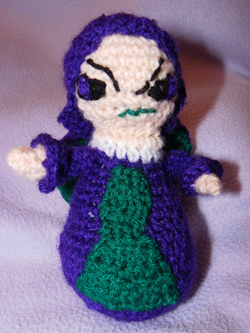 Admit it - you've always wanted a plushie of Jhudora, haven't you? 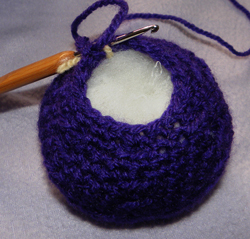 Well, now you can make your very own, with just wool, a crochet hook, some stuffing, and a lot of patience! 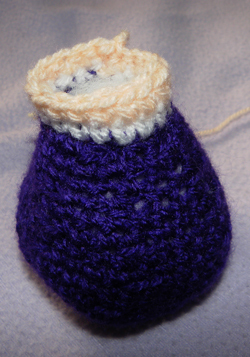 All the pieces are crocheted in a spiral (so no joining any rounds apart from the first one), or crocheted in rows. 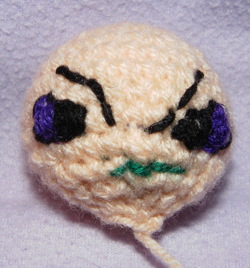 ....but don't worry if you can't crochet - you can always bug a friend or relation to crochet it for you! ....this leads us on into the main body. This is the waist - we now need to stuff the base, otherwise it will be too challenging to do later! Stuff the rest of the body. Fasten off - I didn't use any stuffing in the arms at all. 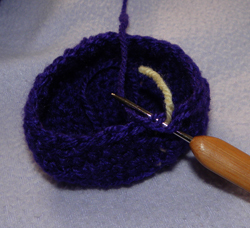 Leave a long tail from the slip knot, so you can stitch the arms to the body later. This round might seem a little fiddly, but if you're patient, it should make sense. I didn't add any stuffing to the sleeves at all, but you can add a little if you like. 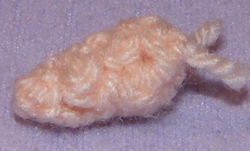 Fasten off with a long tail to attach it to the neck. We now start to work in rows, to make the hair look right - otherwise Jhudora won't be able to see out! 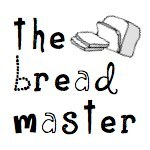 Fasten off with a long tail to attach it to the head. Fasten off, leaving a long tail to attach the wing to the body. Fasten off, leaving a long tail to attach to wing #1. 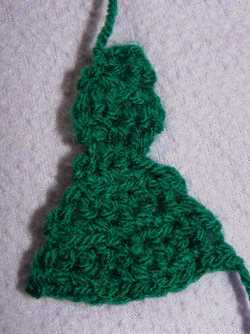 Carefully line up the green to the front of the main body, and firmly stitch it around. Stitch the neck to the base of the head (the hair will cover part of the neck at the back, so don't worry if your stitches are a bit messy!). Make sure the hair is lined up correctly and carefully stitch it to the head, leaving the base parts of the hair unattached to look more natural. Stitch the sleeves to the body. And last but by no means least, Jhudora needs her wings! 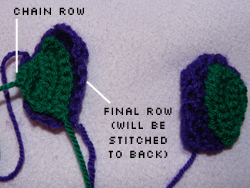 Line up both wings to either side of the centre of Jhudora's back, and carefully stitch them to the body. Then just double check that all the wool ends are woven in. 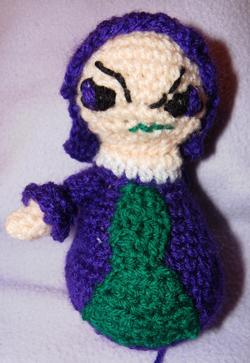 And there you have your completed Jhudora crocheted plushie!